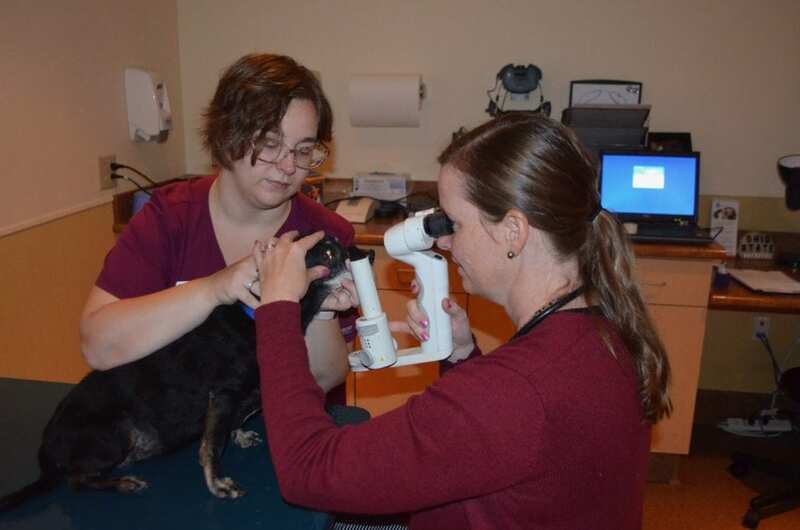 In the two months since she’s been with us, our new arrival Mildred has seen our internal medicine specialist, radiologist, dermatologist, cardiologist, surgeon, and veterinary ophthalmologist. She’s been a perfect little patient, and the news is overall quite good on this elderly girl! 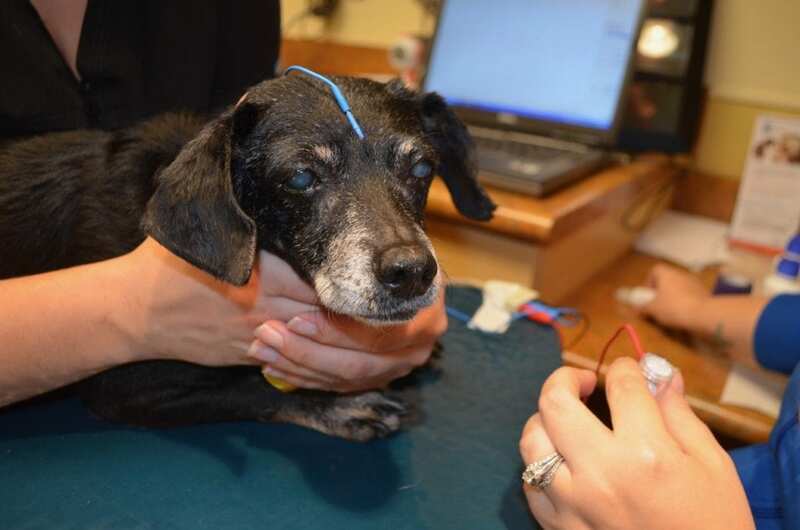 In the photo above, Mildred is getting ready for her electroretinogram (ERG) test a few weeks ago. 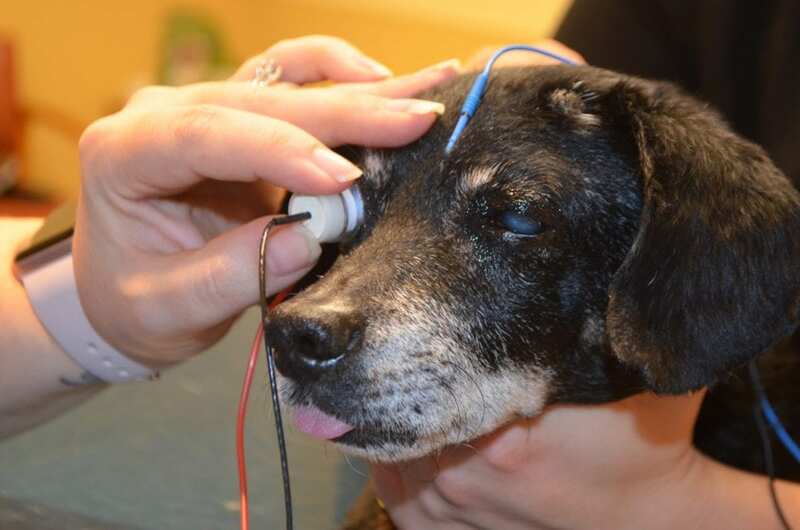 You can see those nice big cataracts in her eyes in that photo; in order to know whether she would be a candidate for cataract surgery to remove them, our veterinary ophthalmologist, Dr. Sarah Hoy, first needed to determine if Mildred’s retinas are still working. This what the ERG does. This test is done on each eye, and measures both types of photoreceptors in the retina, the rods and cones, so we have to wait for the full run to be completed and a final “score” calculated. 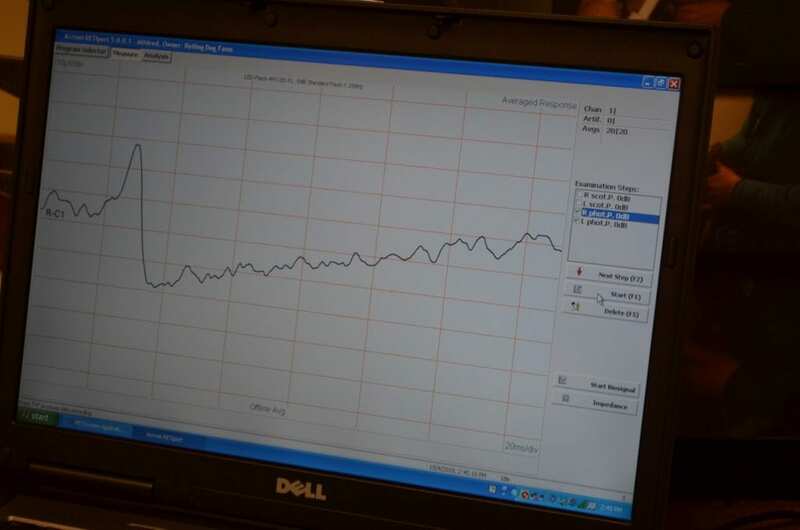 But as each phase is done, and I see a graph like the one above appear on the screen, my hopes go up — and yes, Mildred passed! But even getting to the ERG wasn’t a sure thing. 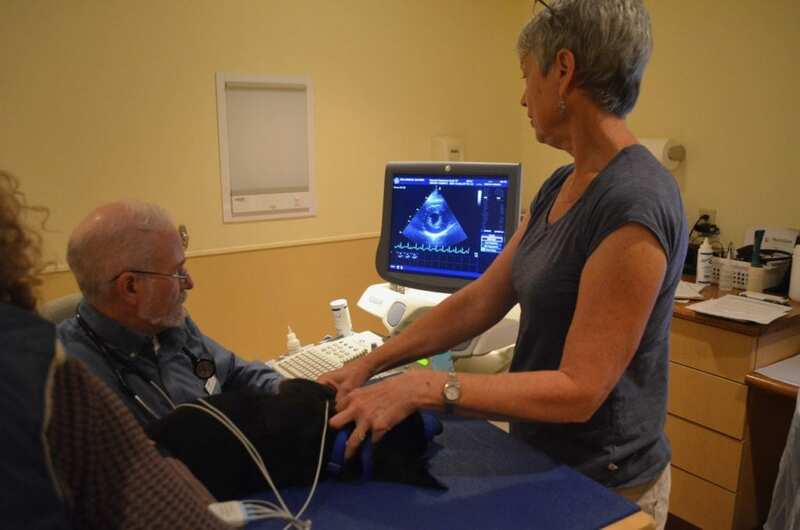 When Dr. Hoy first examined Mildred a couple of weeks before the ERG, she immediately detected a significant heart murmur during her physical exam. (We hadn’t seen our internal medicine specialist yet, who was the next appointment.) She wanted us to see our cardiologist, Dr. Don Brown, to find out if Mildred’s heart was in good enough shape for eye surgery. Dr. Hoy didn’t want us spending money on the ERG we had scheduled for that day in case we found out Mildred was too high a risk for anesthesia. Well, it turns out that Mildred has?chronic degenerative heart valve disease, with moderate regurgitation?in both the mitral and tricuspid valves. Fortunately, her heart is not enlarged, which means we’re catching this early, and Dr. Brown has started her on heart meds. He also felt very comfortable having her going under anesthesia, and discussed with Dr. Hoy the best anesthesia protocols to use with Mildred. — At her first visit to Peak, the radiologist found during the abdominal ultrasound that Mildred has a biliary mucocoele, in which the gallbladder begins retaining mucus. This is a chronic condition and may lead to having her gallbladder surgically removed, but for now our internal medicine specialist at Peak, Dr. Marielle Goossens, is doing “medical management ” of the disease with liver medications. We will be doing regular ultrasounds to monitor the condition of her gallbladder. I hadn’t heard of this disease before, and if you want to read more about it, the American College of Veterinary Surgeons has a fact sheet here. — Mildred was constantly scratching at herself when she arrived, and had thin, balding spots on her body. It wasn’t because of fleas, since the shelter had been treating her for that kind of problem. So we asked the veterinary dermatologist at Peak,?Dr. Edward Jazic, to?examine her. He found she has allergic/atopic dermatitis, and has started her on several skin meds that have quickly resolved the problem. — Because Mildred came with a mild limp in one front leg, we wanted to know what might be causing it and whether it needed medical attention. So our veterinary surgeon at Peak, Dr. Kurt Schulz, examined Mildred and found the limp was probably from an old injury of some sort, but she was not in any pain and that we should just keep an eye on it to make sure it wasn’t progressing. And in fact, since she’s been with us, the limp has actually become quite a bit less noticeable. 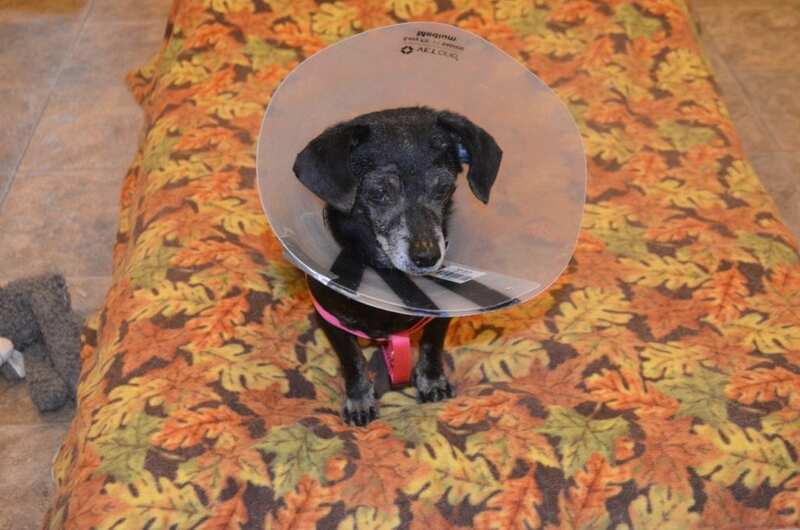 All of that led to the big day last Tuesday, in which Mildred had her cataract surgery. Dr. Hoy called after the operation to say Mildred had done really well during the procedure, and now her eyes are clear once again with brand new lenses! Mildred is back home, wearing a cone to keep her from pawing at her eyes, but cone freedom day is not too far away … her re-check is next week. If all goes well, the cone comes off. Even with that cone on her head, Mildred still comes skittering into the house with surprising energy, sometimes showing us some funny dance moves along the way. She wags her tail constantly, and often does play-bows with us. Despite her age, she is one spunky little gal! Mildren certainly is a sweet, well-behaved dog at the vet! She is so cute, too. I have a soft spot for dachshund mixes. I’m so glad that she was able to have the surgery and can see again. Thank you for giving her such a happy, safe life. Wow, little Mildred has sure gone through a lot since she arrived. But I know she realizes that she’s getting the best of care. And now she can see! How terrific is that? What a transformation from those cloudy eye to the ones above. and I love the photo above with her little tongue peeking out. Now she gets to see her family and all her friends. She must be so happy. Thanks for taking such good care of her and all the other special ones. Love the story and especially the loving care you give to animals. Bless her heart, she went through a lot! You know, I wish there was a Rolling Dog for humans, what a great way to live out your later years. God bless you all.